During the holidays, you can never be too glamorous! 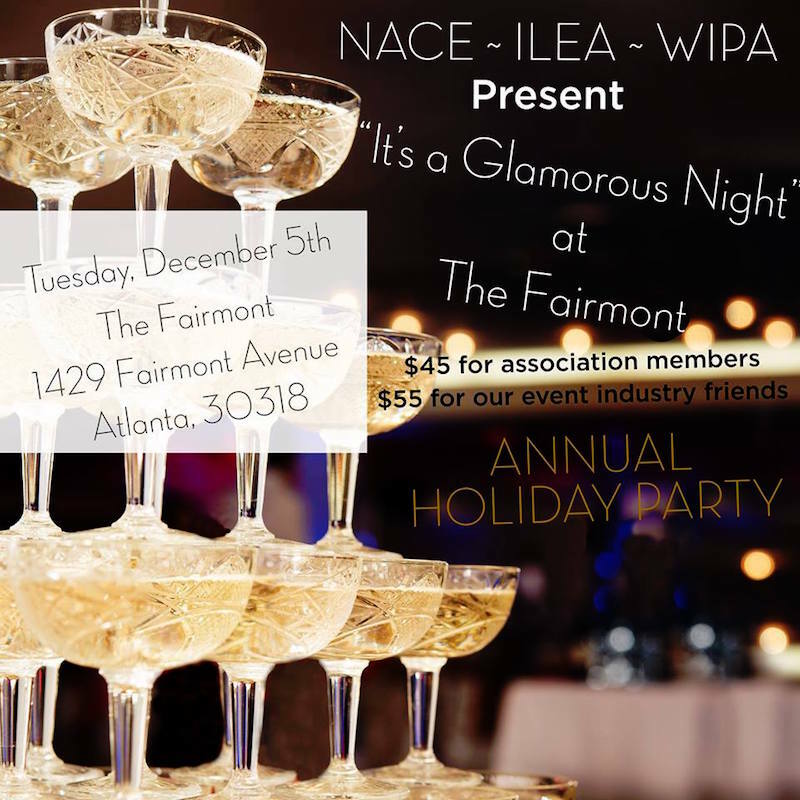 NACE + ILEA + WIPA organizations are joining forces to present the hospitality industries’ annual holiday party, “It’s a Glamorous Night at The Fairmont” This year’s celebration will be held Novare Events’ newest venue, The Fairmont. The Fairmont is located on Fairmont Avenue, off Huff Road in the beautiful Westside. The striking warehouse space has been converted into a modern, industrial venue and is the perfect setting for a glamorous, mid-century modern gala. “It’s a Glamorous Night at the Fairmont” is set for 6-10 p.m. on Tuesday, December 5th. Tickets are $45 for members of NACE, ILEA and WIPA and $55 for future members and friends. Dress is holiday festive. Free parking is available at The Fairmont. However, carpooling or using Uber or Lyft is advised. Click here to purchase tickets to attend this festive event. ILEA consists of more than 7,200 professionals in 38 countries who are live event producers, caterers, designers, decorators, florists, destination management companies, rental companies, audio-visual and special effects specialists and venue managers. Run entirely by volunteers and advised by a member-elected Board of Directors, the ILEA Greater Atlanta chapter meets monthly. Those meetings spotlight metro Atlanta venues and vendors while cultivating networking and educational opportunities. WIPA is the leading source of expertise in the wedding industry. The organization’s mission is to advance the industry’s ethics and standards while promoting its members’ professional growth. NACE has the honor of being biggest and longest-running professional society that encompasses all facets of the catering and events industry. The organization cultivates opportunities to improve client services and marketing opportunities while recognizing excellence in members and holding a high standard of ethics within the industry.